Sikkim, a former kingdom, is a Buddhist state in northern India, next to the Tibet border. Mt Kanchenjunga is visible from every hilltop and is the protecting deity of Sikkim. Most mountains and lakes are considered sacred and temples have been built near them. 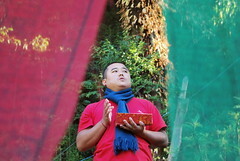 Prayer flags at Khecheopalri Lake, Sikkim. see photo story at Alastair Humphreys website.